In order to increase the comfort benefit provided by the modulation of our Chinook gas furnace, we developed an outdoor unit named Alizé, which offers variable speed cooling. This combination ensures the benefits of a variable speed forced-air system for a 12-month period instead of the heating period only. Our outdoor unit which provides variable speed cooling is also an air-to-air heatpump , thus able to provide heating and cooling in combination with our Chinook gas furnace as well as with our Supreme electrical warm air furnace. The Alizé provides a very small footprint which is welcomed for the backyard, as well as a super silent operation for quieter afternoons on the deck. 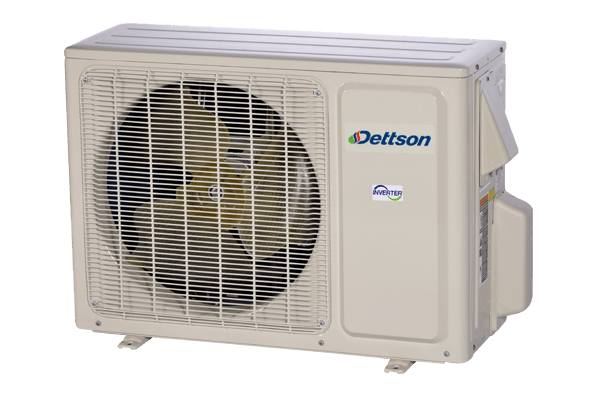 Dettson is the first HVAC manufacturer to use a side-discharge only approach for residential central systems.